Figure 1. Map of East Boulevard Road Conversion. East Boulevard, a four lane, undivided roadway, was prone to high speed travel with a high level of rear-end, side-swipe, and left-turn collisions. Despite having a high volume of pedestrians, the roadway was not pedestrian-friendly and offered few crossing opportunities. 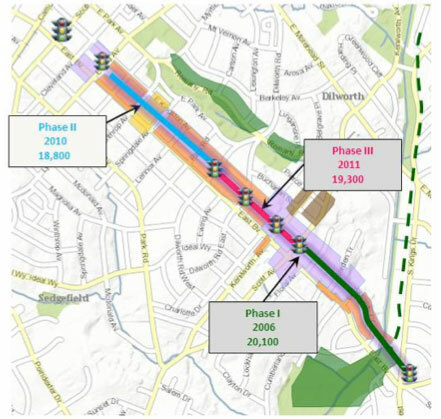 The City of Charlotte undertook a complex, three-phase road diet (also called a lane conversion) over a 1.5 mile segment of East Boulevard in order to moderate travel speeds, increase pedestrian comfort and safety, and help to bring about the community’s vision for the corridor. The project was implemented in phases over 5 years and resulted in more travel lanes (a mix of bicycle and motor vehicle) through a road diet with over 20 pedestrian refuge islands at intersecting streets and in mid-block crossing areas. East Boulevard divides the Dilworth Neighborhood, a historic, walkable area in Central Charlotte. The street is home to many uses, including office buildings, retail centers, multi-family housing, a major hospital, a park and greenway, and a bus route. The roadway was not comfortable for bicyclists and pedestrians due to high volumes and high speed traffic. The road is an arterial traveling through the neighborhood but created a barrier for those traveling by foot, bicycle or by transit. Figure 2. Before the Phase 1 conversion, East Boulevard had four lanes. 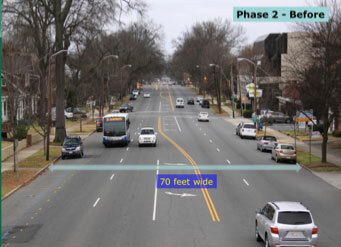 The City and neighborhood agreed on a plan that transformed the street and adjacent neighborhoods into more of a main street environment with aesthetics such as trees, and making it easier to bike and walk along and across the road, while moderating motor vehicle speeds and handling the same amount of motor vehicle traffic. Through surveys and meetings conducted to inform the development of a city-wide Pedscape Plan which was adopted in 2002, the residents articulated their desire for the roadway to accommodate all users. 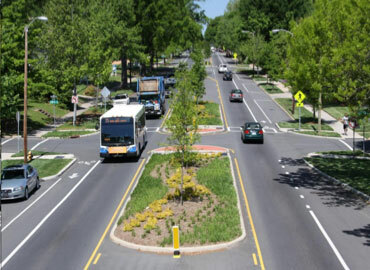 Residents recommended both functional and aesthetic improvements, including the addition of improved pedestrian crossings, more sidewalk cafes and outdoor seating, a tree-lined avenue, and pedestrian-oriented development in line with the City’s unique character and history. Figure 3. After the conversion, this Phase 1 section was converted to 2 lanes, and bike lanes, a pedestrian refuge, and crosswalk were added. The City worked with residents regarding the East Boulevard proposal and design details, and a detailed traffic simulation showed that a three-lane conversion would not significantly impact motor vehicle level of service. The Dilworth Neighborhood voted unanimously to support the project in April 2005, and a construction contract was approved in March 2006. In addition to reducing the vehicular lanes from five to three and adding new bicycle lanes, the sidewalks on the bridge were widened to 12 feet and were constructed of stained and stamped concrete to simulate the red pavers that form the sidewalk on the “Tryon Street Mall” through most of Uptown. Decorative pedestrian scale lights were added, and the outside rails on the bridge were replaced with black anodized aluminum to match the lights. Finally, the plain concrete end walls at the both ends of the railings were replaced with place-making architectural pieces, with “Uptown” and “South End” lettered at each end to indicate the connection the bridge makes between the two neighborhoods. Figure 4. This Phase 1 section was 40 feet wide with four lanes before the conversion. The total funding amount was $1,300,000, which included all associated costs: public meetings, project administration, planning and design, surveying, right-of-way acquisition, utility relocation, consultant fees, construction, signalization, permits and landscaping. 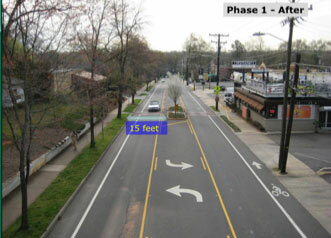 Using Charlotte’s Urban Street Design Guidelines, East Boulevard was transformed to a multi-modal street. The East Boulevard transformation was completed in three phases from 2005 to 2011. Phase 1, completed in 2006, focused on the roadway conversion between Scott Avenue and Kings Drive, reducing motor vehicle travel lanes from four lanes to three. It also included adding one bike lane in each direction, adding a two-way center lane for left hand turns, and constructing 5 mid-block pedestrian refuge islands. Phase 2, completed in 2010, duplicated Phase 1 changes to another segment, and included landscaping. Phase 3, which connects Phase 1 and 2, was completed in 2011. Figure 5. This Phase 1 section was converted to two lanes with a center turn lane, pedestrian refuges and crosswalks, and bike lanes. The project was completed from 2005 to 2011 in three phases and carries a similar number of vehicles as it did before. As a result of the changes, pedestrian and bicycling conditions have improved dramatically, crash rates (all types) have decreased, as have motor vehicle speeds. Operationally, all traffic (pedestrian, bicycle, and motor vehicle) in the commercial area now functions more efficiently, with turn lanes for vehicles, bicycle lanes, and pedestrian refuge islands. Between 2004 and 2011, annual average daily traffic (AADT) dropped from 25,000 to around 16,000. Traffic on the Phase 1 section dropped a little, while traffic in the Phase 2 section increased a little. Safety has improved, with speeds in the Phase 1 section dropping 3-4 miles per hour, and a bigger drop in speed in Phase 2. Overall, crashes decreased in both sections, from 2.64 to 1.67 crashes per month in Phase 1 and 1.97 to 1.86 crashes per month in Phase 2. Improvements in safety have gone hand-in-hand with a 47% increase in non-residential property values in the Phase 2 section, which raised annual tax revenues by $530,000. Figure 6. 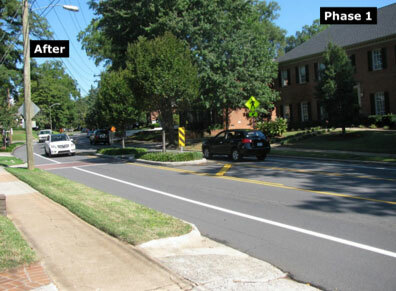 This Phase 2 section had four lanes and a center turn lane, and it measured 70 feet wide, before the conversion. Before and during construction motorists, residents, and the press voiced concerns and criticism, but afterward, feedback was generally positive. 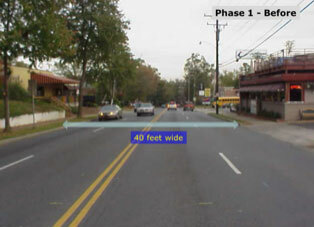 Residents interviewed after the roadway conversion expressed approval of the new crosswalks, which are key Complete Streets elements to navigating the streetscape (Jones, 2012). Some residents reported that they walked more after the addition of crosswalks, and some remarked that they now felt comfortable allowing their children to cross the roadway unsupervised after changes were made to the roadway (Jones, 2012). Many lessons were learned from this project that may inform future Complete Streets initiatives. Above all, citizen education is a key component. A project must begin at the neighborhood level and address outcomes residents and business owners want from their main thoroughfare. Obtaining City Council and local governing agency support, as well as the support of the neighborhood and community association, is crucial. Parties involved in the project should expect that construction period will be difficult, especially with pedestrian refuge islands, and that they should expect complaints. When possible, a limit should be placed on the actual construction time. Before and after studies should be performed, including spot speed studies, volume counts (peak hour and ADT), pedestrian and bicycle volumes, resident and business surveys, travel time, and crash rates. Multi-year studies are especially useful, such as those conducted 3-5 years before (i.e., during a project’s planning and design phases) and after project completion. Figure 7. After the conversion, Phase 2 had two lanes, center medians, turn lanes, crosswalks, and bike lanes. Gallagher, D. (2013a, April 10). Discussion of 2006-2011 East Boulevard Conversion. Gallagher, D. (2013b, April 30). 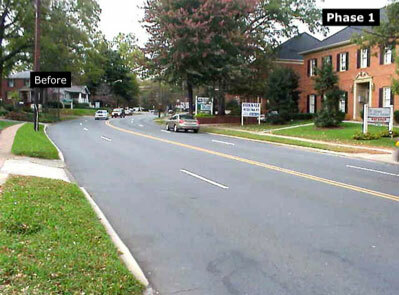 Creating Great Streets – Through Road Diets, Conversions & Rightsizing: The Charlotte Experience. PowerPoint.